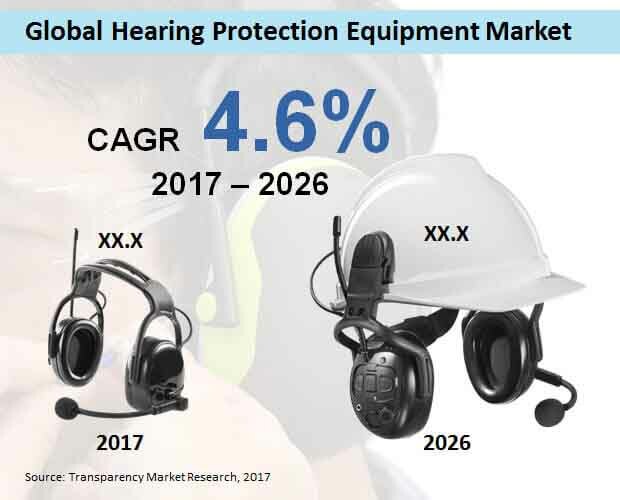 Transparency Market Research (TMR)’s recent report projects that the global hearing protections equipment market will witness a steady CAGR of 4.6% during the forecast period (2017-2026) and reach valuation in excess of US$ 5,000 Mn. Increasing concerns incidence of hearing loss due to high noise levels in manufacturing plants and other manufacturing sites has led to adoption of hearing protection equipment across industries. Moreover, enactment of stricter worker safety regulations is expected to support the growth of the global hearing protection equipment market. Demand for such equipment is also on the rise owing to factors such as growing employment in construction sector, rising demand for hearing protection devices (HPD) in manufacturing sector and introduction of next-gen HPD in defense and maritime. Robust industrialization and urbanization in countries such China, Brazil and Indian is also providing an impetus to the global sales of hearing protection equipment. In addition, availability of low cost hearing protection equipment is another factor that is likely to favour the growth of the market during the forecast period. Key trends expected to influence the growth of the market include development of custom-tailored hearing protection equipment, and increasing focus of development of technology driven equipment. However, lack of awareness among consumer about such as products and issue of hearing attenuation is may undermine the future prospects of the hearing protection equipment market. Hearing protection equipment are being increasingly used in industries such as construction, agriculture, manufacturing, oil & gas, and pharmaceutical among others. Further, local authorities in developing countries are introducing new policies that are directed towards improving the working conditions in manufacturing facilities in the country. Workers in developing countries having a greater risk of damaging their sensory organs or picking up injuries at work as most of them work without wearing any safety gears. However, increasing efforts by government to spread awareness regarding safety measures that need to be followed at work has resulted in an uptrend in demand for safety equipment, including hearing protection equipment. Demand for hearing protection equipment is likely to remain relatively high in North America over the next couple of years. In term revenue, the region currently accounts for the largest share of the global market and trend is expected to continue beyond 2018. The market is North America is projected to increase at steady CAGR of 4% during the forecast period. High preference for single use earplugs is observed in various industries. Although single use earplugs have a relatively higher cost, but they are more hygienic due to single use. These earplugs are can be beneficial to worker safety and productivity in a variety of environments. Towards the end of 2026, more than US$ 1,700 Mn worth single use earplugs are expected to be sold globally. Use of hearing protection equipment is likely to remain relatively high in the manufacturing industry. This because, in the manufacturing industry, workers are often exposed to high level of noise, hence, it become extremely important for them to have proper noise protection. In 2017, over US$ 700 Mn worth hearing protection equipment were sold in the manufacturing industry. Leading players operating in the global hearing protection equipment market, include - Grainger, Inc, Uvex Safety Group, Avon Rubber Plc., Honeywell International Inc., E I Du Pont De Nemours and Co., 3M Co, Ansell Limited, Msa Safety Inc., Bullard, and Kimberly-Clark. The report also delivers as holistic perspective on market’s growth in terms of revenue estimates (in US$ Mn). The data presented in the report are evaluated by taking into account various macro and microeconomic factors along with existing element impacting the market on a global level. Further, the report cover key industry developments and important market indicators for the global hearing protection market. In addition, a comprehensive segmental analysis have been offered in the report. This report on the global hearing protection equipment market offers an in-depth cross segment and cross country analysis based on the different segments including application and product type. Based on application, the market for hearing protection equipment market has been segmented into construction, transportation, food, manufacturing, chemicals, agriculture, oil and gas, pharmaceuticals, mining, and defense & maritime. On the basis of product type, the market has been segment into single use earplugs, pre-formed earplugs, semi aural and earmuffs. TMR has utilized a novel and highly efficient research methodology for gathering revenue estimations for the global market for hearing protection equipment. Moreover, an in-depth and comprehensive secondary research has been conducted for estimating overall market size and identifying prominent market participants. The information offered in the report has been sourced from credible inputs of company executive and industry expert through exhaustive primary interviews. Such research profound process allowed an unbiased of market analysis and forecast rendering. Information obtained through primary and secondary research are verified carefully using leading-edge tools for making definitive conclusion on the global hearing protection equipment market.